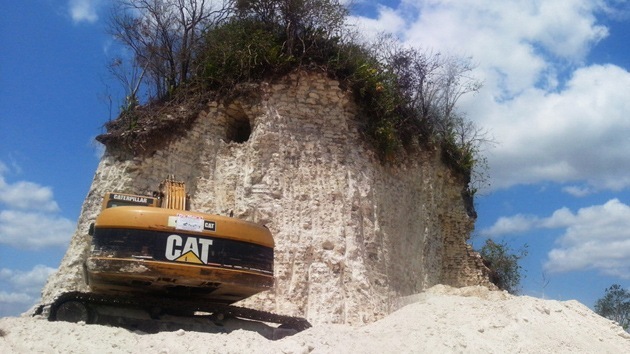 The machinery of a construction company has destroyed one of the most important archaeological treasures of Belize with the most idiotic possible purpose: to get gravel from it. The pyramid of Nohmul was erected some 2300 years ago and are part of the most important patrimonial set of Belize, located not far from the Mexican border. Belizean police claims to be investigating the incident and may lay charges against the vandals. The Amazigh League for Human Rights denounced the destruction of several Neolithic engravings in Toubkal National Park, south of Marakesh. Among the damaged art is said to be a depiction of the Sun as a god. They date from c. 6000 BCE. Source and more details: BBC (h/t Stone Pages’ Archaeonews). and regional authorities had showed that the claims were unfounded. The wording is at the very least strange: the logic does not seem sound (can’t happen because of our values) and the suggestion of other reasons for the same vandalism are at the very least suspicious. My reading is that the Moroccan Ministry of Culture wishes to deny all kind of militant Salafist activism but that, subtly, acknowledges the destruction, attributing it to mystery causes (either erosion or mindless vandalism) rather than Fundamentalism. Dolmen destroyed in Galicia in search of non-existent "treasury"
An excavator machine destroys a 6000 years old mámoa (dolmen tumulus, usually with a dolmen inside) in the parish of Pinzás (Tomiño, Galicia). It is speculated that the vandals were searching for mythical treasury. In the past many dolmens were broken in and vandalized for similar reasons but this is the first case ever known, I think, to have been done with modern machinery for such a reason. If anyone wonders, there’s no treasury in them. At least no treasury other than archaeological knowledge and the pride of a deeply rooted history. Source[es]: Faro de Vigo (via Pileta).